For most patients, dental implant treatment is the best solution to missing teeth. They have many benefits, including sturdiness, reliability, and a beautifully natural appearance. When cared for properly, they should last for many years, very possibly the rest of your life. The complex process of placing and restoring implants requires advanced technology, and a dentist with a specific skillset and specialized training. Award-winning periodontist, Sanda Moldovan, has exactly the type of expertise needed to perform implant placement surgery and restoration procedures successfully. Additionally, our beautiful Los Angeles office is equipped with state-of-the-art diagnostic technology and devices, facilitating optimal treatment outcomes. 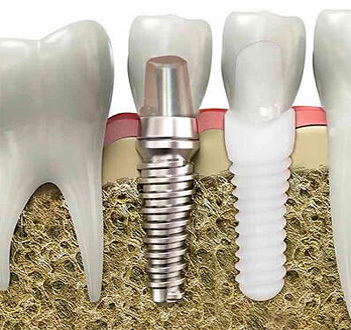 An implant is a small post, made of ceramic or titanium. The most common material is titanium, although there may be allergy concerns. This type of allergy is very difficult to test for, and even the most accurate type of test may yield false positives. However, Dr. Sanda offers patients an option and she recommends metal-free implants if allergies are a concern. It is implanted into the jawbone in a surgical procedure. An implant acts as a prosthetic tooth root, providing support to the replacement tooth or teeth. The actual implant is not visible once the process is complete. Like a natural root, it is hidden under the gum line. All you will see is the restoration, usually made of ceramic, which looks exactly like a beautiful and natural tooth. In a minor oral surgery, the post is implanted into the jawbone. As the bone heals, it attaches itself to the implant surface, providing complete stability. The restoration (either a specially designed crown, bridge, or denture) is then attached directly to the implant post. When the process is complete, you will look and feel like you have natural, healthy teeth. This procedure also helps protect your oral health in the future. Implants stimulate the bone tissue, just as a natural tooth root would, which helps prevent bone loss. Call (310) 651-6588 and speak with our friendly staff to schedule a consultation.